A new and improved version of this effect is Positive Increases . The original version will remain available at a reduced price. Impromptu mentalism with nothing but a pen and your business card! Based on an effect by the remarkable Max Maven. You write something on the back of your business card and set it aside. You give your participant three imaginary coins. She chooses one and then flips it into the air. She tells you whether it landed heads or tails up. You turn over your card, revealing that you wrote which coin she would choose and its orientation. This ebook has been rewritten in much more depth, with a lot more of the thinking and philosophy behind the routine. 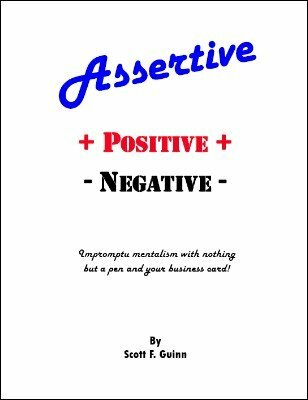 Assertive Positive Negative has been Scott's all-time best seller. The appealing aspects of the routine: It's an anytime, anywhere impromptu miracle with NO set-up, NO extra props besides any scrap of paper and a writing implement (both of which can be borrowed), NO sleight-of-hand, NOTHING to clean up or ditch! 1st edition 2009; 7 pages.